Home » froyo time frozen yogurt , frozen yogurt , las vegas » Froyo Time is the first and only Froyo shop in Las Vegas to offer delivery. 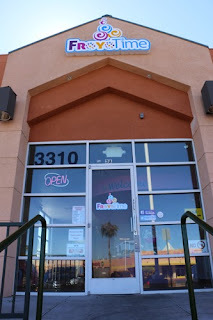 Froyo Time is the first and only Froyo shop in Las Vegas to offer delivery. +Froyo Time is open for business. I have eaten plenty of frozen yogurt, but their fudge brownie batter frozen yogurt is the best of the best! 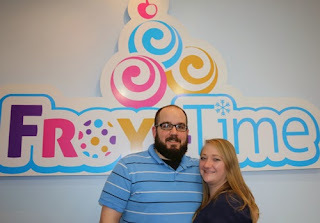 Owners Brittney and Rob both had previous experience in the Las Vegas restaurant scene. Brittney grew up managing and running the family owned diner while Rob developed and operated a local restaurant delivery service. They both enjoyed the work, but had an ever growing dream of building their own family owned business together. After discussing several ideas, they kept coming back to the idea of frozen yogurt and it was time to get a little more serious and dig a little deeper. As fate would have it, after first contacting YoCream, a Dannon Yogurt company (located in Portland, OR), they learned about a class called YoCream University that would be happening just 3 weeks after that first phone call. YoCream University teaches aspiring frozen yogurt entrepreneurs about the ins and outs of the industry. It was in that moment that they knew they were on the fast track to their dream. 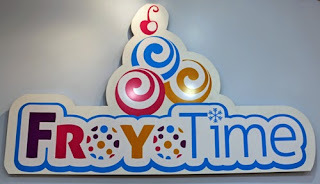 They dove right in and within a matter of months and a lot of love and support from friends and family, Froyo Time store #1 opened its doors. After being open for a few months, and seeing many smaller kids have difficulty seeing over the toppings bar while seeing their parents struggle to hold them up to see, they knew they had to make an adjustment. The step stools are a great way for the kids to feel that sense of independence. When they are able to do it themselves, it only enhances their experience. Plus, it gives mom and dad a break as well, making the step stools work out great for everyone. your card with every purchase. Mention come2vegas.com for another 10% off! cups/spoons, and 2 Froyo serving scoops.